Another cookie recipe! Yeah, I've been on a cookie kick lately. Yesterday I wanted to make some kind of cookie recipe, but I wasn't sure what I was in the mood for. 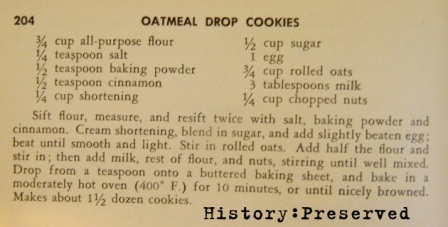 I half-heartedly chose Oatmeal Drop Cookies from The Modern Family Cook Book by Meta Given, ca. 1942. Well, if I thought I had a regular oatmeal cookie recipe on my hands, I was totally wrong! This little recipe ticks all the boxes of a great ration recipe - low sugar, low fat, whole grains. First off, the 1942 version has you sift the flour twice which affects the texture of the cookies. They're not as close and chewy. You can tell that the rest of the preparation is very different from the modern one too. 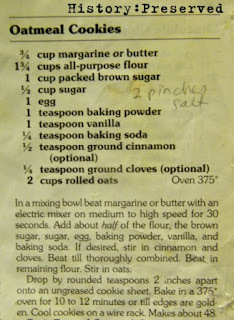 Once you cream the shortening and sugar together with the egg, you add the oats. I had to read that step twice, because I'd never had to do that before! After mixing up the whole thing, it was a little watery, but it firmed up pretty quickly from the oats soaking up the liquid. Then, there are the nuts. I don't think I've ever had nuts in oatmeal cookies before - just raisins or chocolate chips. I used pecans, like usual. 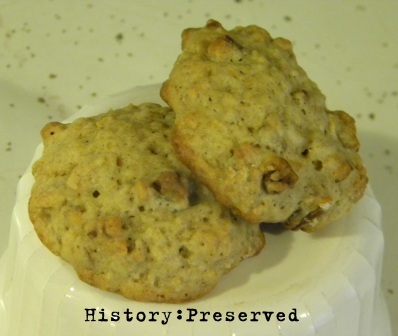 So, the final result was a light-textured cookie, not as dense in oats, but still retaining that oatmeal cookie flavor. The nuts were quite nice too! This recipe is also nice in that it uses a bit less fat and sugar per cookie than the modern recipe. They're the type of cookie that you don't feel gross after eating - it's not super buttery and it's not super sweet either. That's a good thing! The modern recipe is still my favorite, but this older version is still pretty tasty. P.S. You can check out another Oatmeal Drop Cookie ration recipe I tried back in 2014 from a different cookbook. The recipe is really different from this one!